After a fledgling start and a cancellation of The Original Series after just three seasons, Star Trek has since emerged from its humble infancy into one of the most popular and fervently followed franchises in the entire entertainment business. Trekkers, as its fans are called, go so far as to dress up like their favorite characters and attend conventions throughout the world. Since The Original Series, there have been three television sequels and two prequels, an animated series, and thirteen films to continue the rich tradition. Those are complemented by paraphernalia of all sorts, which attract fans of all ages. While every Star Trek fan has their own favorite moments, almost to a person they will tell you that The City on the Edge of Forever is among their favorite episodes. It explored issues of war and peace through drama, humor, and memorable dialogue. So thought provoking was it that it continues to inspire discussion even today. 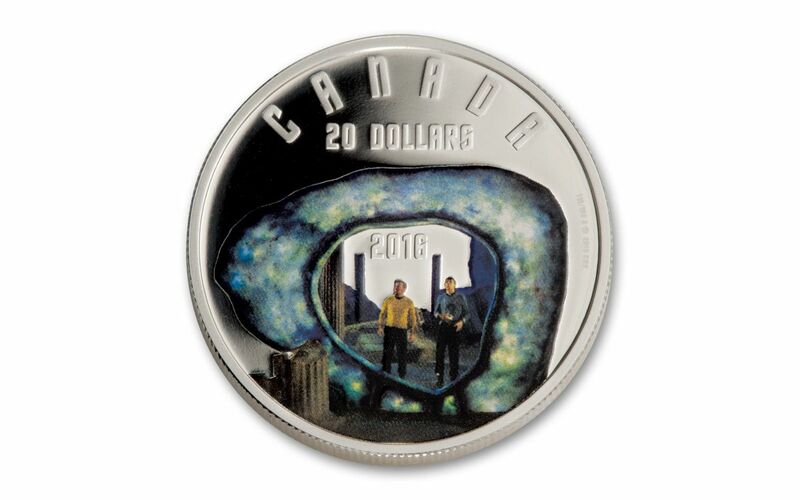 This coin features a classic scene from the episode in which Captain Kirk and Mr. Spock stand among ruins along with the Guardian of Forever. FIRST OF THREE CLASSIC STAR TREK SCENES ISSUES – This 2016 Edge of Forever was the first issue of three to mark the fiftieth anniversary of Star Trek’s debut with a scene from The Original Series. GORGEOUS PROOF FINISH – Struck from 1-oz of 99.99% fine silver at the Royal Canadian Mint, this coin has a stunning proof finish that makes its colorful elements stand out beautifully. CANADA LEGAL TENDER -- Each 2016 Silver Edge of Forever Proof is $20 legal tender in Canada. In addition to being home to one of the world’s elite mints, which produces countless series for a wide range of collectors, Canada is home to breathtaking scenery, which includes endless forests, deep blue lakes, and stunning shorelines. CERTIFIED FLAWLESS – Your coin will be certified Proof-70 Ultra Cameo (PF70UC) by Numismatic Guaranty Corporation (NGC), a distinction that means your perfectly-graded proof will have ZERO imperfections -- showing all features and fields exactly as the engraver and mint intended! 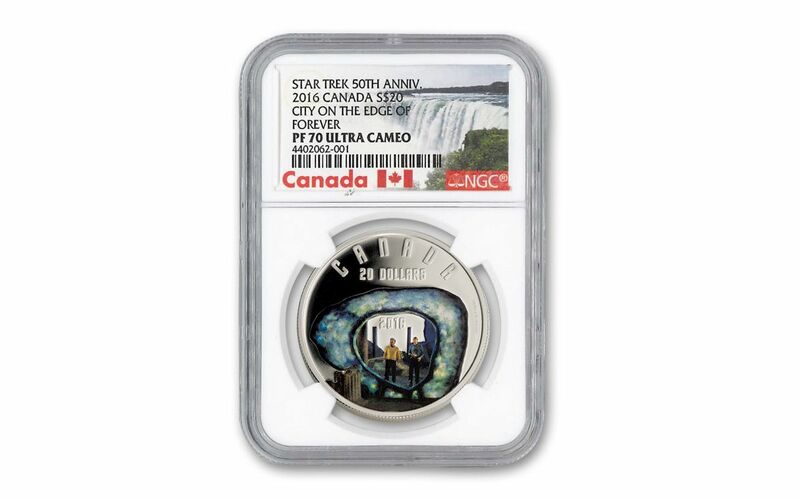 A LIMITED MINTAGE – Only 11,500 pieces were authorized in this mintage, a very low number given that even non-coin collector Star Trek fans are sure to want this coin. The City on the Edge of Forever confronted audiences with ideas about war and peace, and about what might have been had a particular pacifist survived to prevent a World War. Given the tumultuous time when the episode was released, it couldn’t help but make viewers ponder about the Vietnam War. It gives modern viewers things to think about with the ongoing wars today. 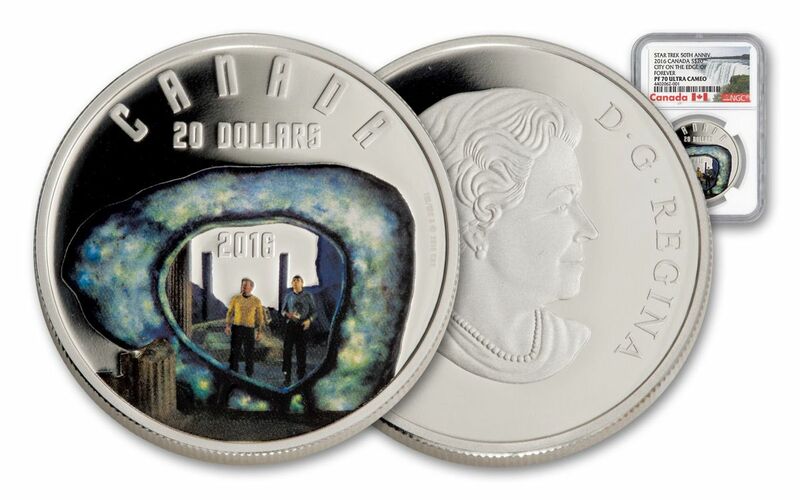 Given Star Trek’s ardent following, this coin will not be available for long, so order now at GovMint.com!